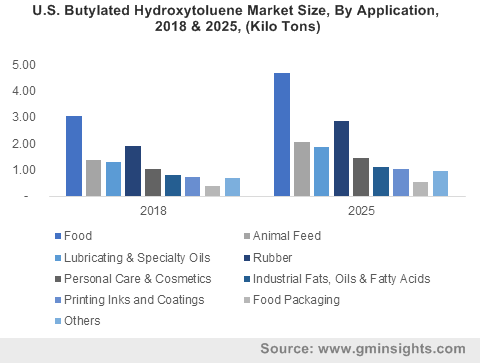 Butylated Hydroxytoluene Market size was over USD 250 million in 2018 and industry expects demand of above 75 kilo tons by 2025. Increasing demand of food additives due to growing consumption of processed foods including meat, noodles, and ready to cook food stuff will tend to increase butylated hydroxytoluene consumption. BHT acts as antioxidant and preservative which helps to prevent food spoilage. 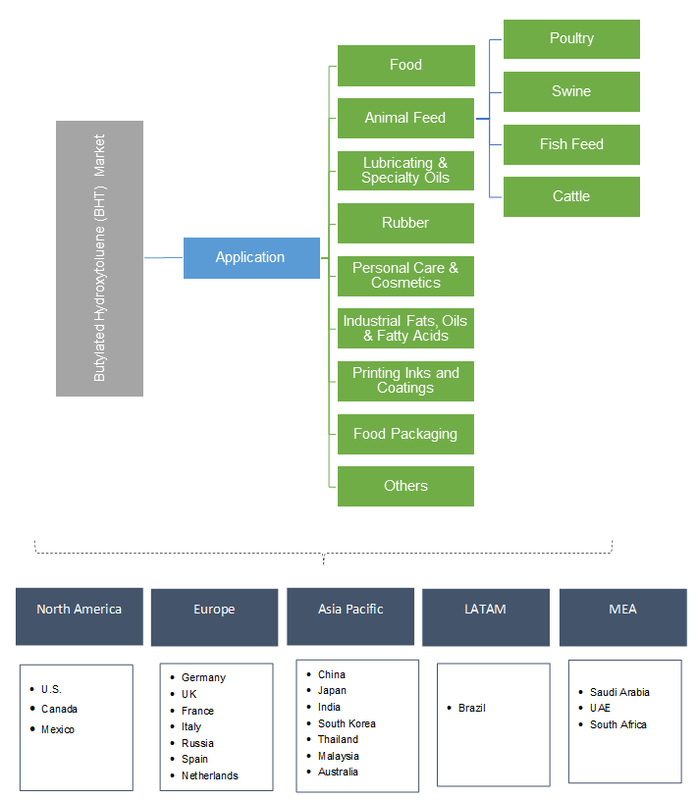 Processed food market is expected to grow at 4.5% during the forecasted timeline. This will have a positive impact on the market size. Growing industrialization has led to increase in manufacturing activities across the globe. BHT due to its thermal degradation protecting property is utilized for manufacturing lubricants & greases. Rising manufacturing activities will require more processing equipment thus fostering industrial lubricants demand. This will promote global market size. Butylated hydroxytoluene removes free radical intermediates thus slowing down the chain reactions. These free radicals formed otherwise may cause damage to human cells. It also helps to maintain pharmacological effects thus are used for preparing tablets, capsules, gels, and other pharmaceutical drugs. Increasing research and development activities in pharmaceutical industry due to rising chronic health diseases will increase global market profitability. Butylated hydroxytoluene helps to avoid oxidative stress which effects productive performance in poultry animals. The product also improves colour and reduce rancid taste in meat & eggs obtained from poultry birds. Changing food habits and consumer purchasing power will increase poultry products consumption hence promoting butylated hydroxytoluene market size. Butylated hydroxytoluene is utilized for manufacturing personal care products including eye liner, moisturizers, lipsticks, eyebrow pencils, eye shadows, foundation, and face powders. The product acts as antioxidant & preservative and slows deterioration of cosmetics which occur owing to chemical reaction in presence of oxygen. Global lipstick market is expected to grow over 6.5% by 2024. This will amplify butylated hydroxytoluene market size. BHT due to its oxidation limiting property is added to fish oil and meal. It helps to prevent lipid oxidation present in fish and fish products. Rising demand of caviar and other fishes due to increasing disposable incomes of consumers will have a positive impact on the market. Extensive utilization of BHT as food additive is known to have health effects including carcinogenic activity and liver enlargement. Presence of several natural antioxidant substitutes including polyphenols, vitamin E, and vitamin C may hamper butylated hydroxytoluene market profitability and industry price trends. Butylated hydroxytoluene market from printing inks and coatings application may witness significant gains over 4.0% by 2025. BHT is utilized for manufacturing printing inks and coating due to its anti-skinning properties. It helps to prevent frequent ink drying. Escalating demand of newspapers, books, and magazines due to increasing education awareness in Asia Pacific region will promote product demand. Butylated hydroxytoluene market size from rubber application is expected to surpass USD 80 million by 2025. The product functions as non-discolouring and non-staining antioxidant for manufacturing rubber products. Increasing rubber demand to manufacture tyres for vehicles will amplify BHT market growth. Butylated hydroxytoluene from animal feed application may observe significant gains over 5.0% by 2025. The product protects animal feed against lipid peroxidation. It has applications in manufacturing feed for poultry, fish feed, swine, and cattle. Rising consumption of meat and animal derived food products owing to high protein content will promote product demand. Butylated hydroxytoluene from food packaging materials application is expected to surpass USD 10 million by 2025. The product due to its antioxidant effects is added to packaging materials including plastic or wax paper bags, thus preventing food spoilage. Technological advancements for introducing smart packaging techniques to improve storage life for food products will fortify food packaging products demand. This will increase BHT industry growth. Asia Pacific led by South Korea, Japan, India and China, butylated hydroxytoluene market is estimated to surpass USD 125 million in the estimated timeframe. BHT prevents lipid oxidation in food products including processed foods, meat products & baked goods. Increasing consumption of breads & cookies owing to changing lifestyles and busy schedule will promote baked goods consumption hence fostering regional product demand. Europe led by UK, Italy, France and Germany, butylated hydroxytoluene market may record robust gains over 5%. The product is utilized for manufacturing cosmetics products including moisturizers, sunscreens and eye liners. Growing demand of personal care products owing to rising importance of grooming among teenagers in the region will increase the global market growth. Brazil market may witness significant gains in the estimated timeframe. BHT is utilized as an industrial fluid additive. Growing petroleum processing, chemicals manufacturing, iron & steel production will foster industrial fluids demand which will have a positive impact on regional product demand. Global butylated hydroxytoluene market share is moderately fragmented and competitive with major manufacturers include Sinofi Ingredients, OXIRIS, Sasol, Kemin Industries, KH Chemicals, and Eastman Chemical Company. Companies are involved in strategic alliances including mergers & acquisitions, joint ventures, partnership, and production capacity expansion to implement innovative technologies with growth in production capacity to cater rising product demand. Butylated hydroxytoluene (BHT) is a phenol derivative and is manufactured by reacting p-cresol and isobutylene in presence of sulfuric acid. It is generally recognized as safe (GRAS) and Food & Drug Administration (FDA) compliant. The product is also utilized in jet fuels, gear oils, hydraulic fluids, and turbine oils due to its antioxidative properties.